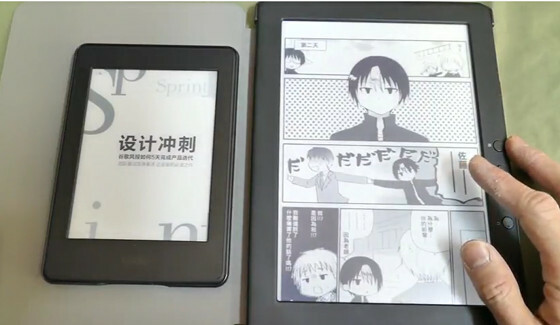 A video was recently uploaded to YouTube showing the 9.7-inch Onyx Boox N96 next to the current 6-inch Kindle Paperwhite. The video lacks narration and it’s not the most informative comparison but it does give a good idea of the massive size difference between the Kindle and the N96. The Boox N96CML is the latest N96 version to get released by Onyx. It’s the one with a frontlight and a capacitive touchscreen. Starting at about the 7 minute mark, one of the things the video highlights is the fact that the Kindle Paperwhite is generally faster to navigate and react. The N96 is so slow to respond that it’s painful to watch at times. The combination of Android and E Ink still requires a fair amount of patience, it seems. guy looked a little frustrated didn’t he?